Description An extended three bedroom semi-detached home now in need of comprehensive modernisation. The property does benefit from gas fired central heating though now requires general updating, allowing a purchaser to modernise the property to their own taste. In addition to the floor plan there are garden areas to the front, side and rear with driveway parking to the rear. Location The property is situated in the "Jenny Field" area of the town which supports some local amenities in the form of a supermarket, public house, primary school, medical centre and the Hydro. The area is only a short distance away from the town centre and is supported by a good public transport system. There are numerous open parkland areas making it ideal for the family. Tenure Freehold with vacant possession upon completion. Services All mains services are connected to the property. 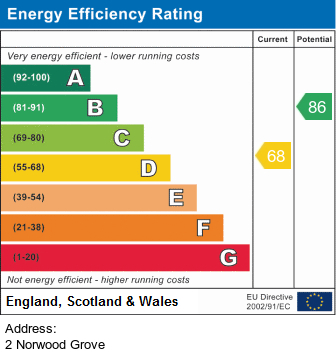 Energy Performance Certificate Grade D.
Solicitor Davidson Broadbent & Co, 5 Raglan Street, Harrogate, HG1 1LE. Tel: 01423 561229 FAO: Michael Davidson.